I’d like to inform the entire world about a horrible act of violence against an oppressed Afghan woman. Perhaps you have read about violence committed against Afghan women in media reports, but the one I’m about to tell you is the worst I’ve ever heard of in Herat province. A few weeks ago a drug addict cut off his wife’s middle finger and a part of her tongue, then cooked and ate both pieces of flesh. The woman, Arefah, is about twenty and married nine years. Arefah, who could barely speak due to her injuries, said last week that her husband had cut her finger and tongue about ten days earlier, then cooked them before her eyes and proceeded to consume them. She also told of how her husband, a drug addict for the past five years, had killed their four-year-old daughter, and how he beat her up repeatedly. Once the beating caused her to miscarry when she was five months pregnant. Arefah’s case came to light because of Maria Bashir, the only woman judge in Afghanistan. Bashir is president of the Court of Appeals in Herat. Bashir told me security forces had arrested Arefah’s husband in the province’s fifth district a week ago, after the woman complained to the court about the assaults. He faces life in prison if forensics tests now being conducted prove he killed the little girl. He could serve twenty years for causing the death of Arefah’s fetus. 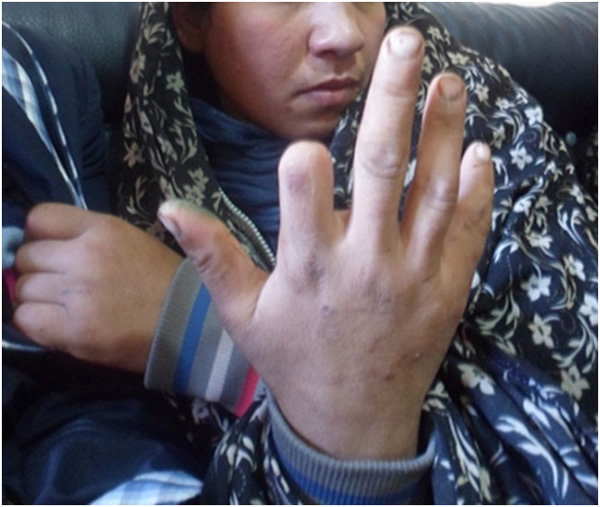 Bashir said that the number of cases of violence against women in Herat province has been on the rise recently, and that in the past eleven months there have been 205 cases of assault on women in the area. It is my hope that having a woman judge now in charge of the court system may help bring that problem under control. Editor’s note: The judge in this case, Maria Bashir, was a prosecutor in Herat Province prior to the Taliban and was reinstated five years ago. She and her family live under constant threat of bombings and other attacks due to her rulings in domestic violence cases. Last year she was celebrated as one of the U.S. State Department’s International Women of Courage. Photo of Arefah by the author. Very sad case indeed. Thanks so much, Zahra, for reporting it. Let’s hope that women like Judge Bashir succeed in bringing these people to justice. Absolutely horrific. I hope someone will help Arefah. Thank you for telling her story. Thank-you, Zahra, for telling Arefah’s story. May courageous Judge Bashir prevail. May Arefah recover and thrive. I’m shocked! How can a person do something like that! It is an absurd… It is cruel… it is not humane. I hope Arefah can find her happiness some day. This broke my heart. Please keep writing about things like this so we can make them known around the world. I hope Life gets better for Arefah. I know those are just words, but sometimes all we have are words. Oh, my! What a horrific atrocity against humanity. Thank you for sharing Arefah’s story. My thoughts go out to her, and I hope justice prevails. For the past two months, I have been editing and putting together a book (working titled): VOICES OF ISLAMIC WOMEN & FROM THE MIDDLE EAST where several members of my website creation: VOICES OF WOMEN WORLDWIDE at http://voicesofwomenworldwide-vowwtv.ning.com have sent the story of their lives … as chapters from Dubai, UAR, Egypt, Pakistan, Indonesia, Jordon, Palestine, etc. Last week, I attended the 56th session of the COMMISSIO ON THE STATUS OF WOMEN and filmed some incredible women from the Middle East. I am wondering whether you would be interested to submit an article of 500-1,000 pages as VOWW promotes “voices for the voiceless” women and young girls ? More information is available on request.